The skills and knowledge assessed on the test are described on the test framework that is available on the program website. To view or print the test framework, see the following section of this guide. The test framework is based on relevant academic standards. The framework is organized for structural and reporting purposes into subareas (or domains), and each subarea contains one or more objectives (or competencies). Each objective is further defined by a number of descriptive statements. These components are described below. Subareas/Domains. Each subarea represents a subject-matter area (content domain) of a test, composed of one or more test objectives. 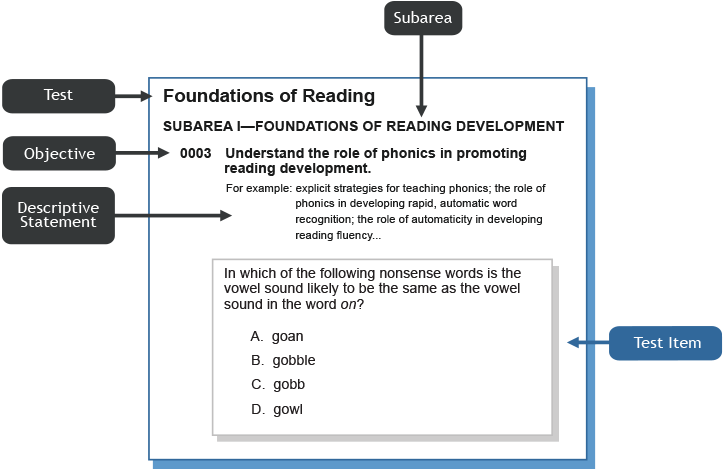 The subareas structure the subject matter for both test preparation and score reporting. Together, the subareas indicate the main areas of knowledge and skills important for the effective beginning teacher. Objectives/Competencies. The objectives are the key elements of the test structure. They are intended to be broad, meaningful statements of the knowledge and skills important for effective beginning teachers. The objectives define the range of knowledge and skills to be measured by the test. Descriptive statements. The descriptive statements further define each objective. A descriptive statement provides more detailed information about the content of an objective by including examples of the types of knowledge and skills covered by the objective. Descriptive statements are intended to provide only examples of the content of an objective and do not cover the entire range of knowledge and skills represented by an objective. Test questions. The test questions, which may be either multiple-choice questions or open-response assignments, are designed to measure specific content defined by one of the objectives. The following example illustrates the relationship of a multiple-choice question to its corresponding objective and descriptive statement in the Foundations of Reading test. Step 1: Read the test objectives for the test(s) you are preparing to take. Reading the test objectives will help you familiarize yourself with the structure and content of the tests, and begin assessing your degree of preparedness to take the test. The test objectives are the only source that specifies the knowledge and skills assessed by this test. Read through all test objectives for the test you are required to take to get a general picture of the material the test covers. The objectives form the foundation and focus for the test questions. The descriptive statements within each objective provide examples of possible content covered by the objective. Read each objective and its descriptive statements carefully for a more specific idea of the knowledge and skills you will be required to demonstrate on the test. Step 2: Read the sample questions, attempt to answer them, and review the correct response provided. This will introduce you to the types of questions you will see on the actual test and help you understand how the questions are aligned to the objectives. The sample multiple-choice questions were developed in conjunction with the questions that appear on actual tests and are the best example of the types of questions used on the actual test. Thus, answering these questions will give you valuable practice in answering questions like the ones you will see on the actual test. After reading a question, you may want to reread the objective to see how the question is aligned to the objective. This may help you understand what items associated with particular objectives might look like. After answering a sample question, look at the correct response provided. If you answered the question incorrectly, you may need to do some additional studying of the content covered by that objective. Step 3: Take the practice test (if available). The practice test includes a wider variety of items that will help you to become more familiar with the types of items that may appear on the test and the depth and breadth of the content covered by the test. You will also be able to practice your test-taking skills, and further assess your degree of preparedness to take the test. Practice tests are designed to simulate the actual testing experience. Each full-length practice test contains the same number of multiple-choice test questions that are found on an actual test and, if applicable, one or more sample open-response assignments similar to those on the test. The practice tests are also representative in form, content, and difficulty of an actual test. An answer key is provided that lists the correct responses and indicates the specific test objective to which each test question is matched. The practice test is available on the program website; select "Prepare" and choose your test. Set aside a significant block of time to take the practice test. If possible, take the sample test questions in a quiet room to simulate the testing environment. Monitor your time and try to pace yourself so that you finish the practice test within the amount of time allotted for the actual test. You may want to skip any questions you have difficulty with; mark these questions and come back to them later. When you have finished, use the answer key and the sample responses to the writing assignments to assess how you might perform on the actual test. Based on your performance, identify your areas of strength and weakness (note that the answer key also indicates to which objective each question is matched), and assess your overall degree of preparedness to take the test. If you skipped any questions, note the objective(s) to which they were matched, and plan to do some additional studying in those areas. Step 4: Develop a study plan to focus your studies. Once you have completed or nearly completed your teacher preparation program, you should already have mastered most or all of the content that you will see on the test. At this point, the best preparation is to identify 1) your areas of strength and weakness (the practice test and sample questions may provide you some idea of the areas on which you wish to focus); 2) any content with which you have had difficulty in the past; and 3) any other content you have not yet mastered. You should then study those areas systematically and effectively. Identify the most appropriate resources. These may include your basic textbooks from relevant courses; your class notes and other assignments; textbooks currently in use in elementary and secondary schools; and publications from local, state, and national professional organizations. Develop a study plan schedule. Consider reviewing a book on study skills development or studying with other people who will be taking the test by forming or joining a study group. In the second column, summarize each objective using a brief phrase (e.g., "Reading Comprehension," "Statistics and Probability"). For this step, you may want to work with others. For each objective and its descriptive statement(s), brainstorm as many ideas as you can about likely test content and possible questions. For ideas, think about your courses and other educator preparation activities. Record your notes in the third column. ?—little or no knowledge and preparation. Make a study plan, starting with areas marked with an X or ?—but remember to plan study time for more familiar areas, too. In the fifth column, note resources that may be helpful (see the ideas above). While concentrating your studies on your areas of weakness, you should also be sure to do some additional preparation addressing the content covered in the other objectives. Remember, your score on each test is based on the total number of questions that you answer correctly; therefore, improvement on any objective of the test will improve your total score on the test. Finally, you may also want to do some additional studying in the subareas which contain the greatest percentage of test questions, as they will contribute the most to your total score on each module. One study method that many students have found to be effective is "PQ4R," or "Preview, Question, Read, Reflect, Recite, Review." After reviewing the objectives and descriptive statements, locate appropriate study materials such as textbooks; then apply the six steps of the PQ4R method as described below. Preview: Scan the section headings and subheadings of the chapter or article you wish to study. Read the introduction or overview section as well as the summary section. This initial step can provide a good foundation on which to build your knowledge of a topic or skill. Question: Based on the appropriate test objectives and your preview of the study materials, think of specific questions to which you would like to find answers as you study. Write these questions down and use them as a guide as you read. Read: Read through the chapter you have selected. Adjust your reading speed as needed; some sections may take less time to read than others. Also, study any figures, tables, or graphics when you come across references to them in the text. This helps to keep each piece in context. Reflect: As you read, think about the examples and descriptions provided in the text. You may also think of examples from your own experience that are related to what you are reading. Reflective reading is active reading; by interacting with what you read, you may better understand and remember the content. Recite: When you complete each section of the text, check your understanding of what you have read. Can you answer the questions about this section that you wrote down before you started? Do you need to reread the section or some parts of it? Monitoring your progress by asking yourself these types of questions may help you identify areas you understand well and areas that you will want to study further. Review: After you have finished reading the text, you may want to check your understanding of the content by reviewing your questions for the whole chapter. Can you answer your questions without referring to the text? Reviewing your questions for a chapter immediately after you finish reading it, as well as later in your study plan schedule, can help you retain and apply what you have learned. Whether you use PQ4R or some other study technique, the key to success is to become familiar with the material you are studying. Predict what the content will be, ask yourself questions about it, paraphrase information aloud, relate the information to other things you know, review and summarize what you have learned—become involved in your studying. Read, listen to, and follow all test directions. The test session is designed to allow sufficient time for you to complete the test. At any point in the test, you will be able to see how much time you have remaining. You can also choose to begin the test in any section or go to any particular question at any time during the test. If you have any difficulty answering a question, you may flag it for review and return to it later, but you must respond to the questions, including those flagged for review, during the allotted time. If your test contains open-response assignments, remember to leave enough time to respond to the assignments. Do not try to save time by skimming directions or by reading the test questions quickly. You may miss important information and instructions. Your response to each selected-response item should be the best answer of the alternatives provided. Read and evaluate all four answer choices before deciding which one is best. Your results on the multiple-choice section will be based on the number of questions you answer correctly. Attempt to answer all questions. You will not be penalized for incorrect responses; it is better to guess than to leave a question blank. If you are unsure about a question, use your knowledge of the content area to eliminate as many of the alternatives as you can; then select from the remaining choices. Your responses to the multiple-choice questions will be scored electronically. It is very important for you to designate your answers carefully. You may wish to use remaining time at the end of the test session to check the accuracy of your work. Respond to writing assignments fully and clearly. If you are taking a test with a written assignment, be sure to read and respond to each part of the assignment(s). It is important for scorers to be able to understand your responses. Also, make sure that you have recorded your responses as instructed. With the help of the test-taking strategies described above, you should be able to use the time before and during the test wisely. There are also a few things you can do after the test that may be helpful to you, whether or not you have passed the test. First, it may be useful to review the list of objectives you used during your studying. Look over that list and mark the objectives that represented the most difficult content for you on the test. Whether or not you pass the test, you may wish to enhance your own knowledge with further study in those areas. Also, when you receive your score report, you will learn which subareas were more or less difficult for you. Devote further study to the content of the subareas in which your performance was the weakest. Remember that all the objectives that were tested have been identified as important to being an effective beginning educator. Copyright © 2013 Pearson Education, Inc. or its affiliate(s). All rights reserved.